Jean M. Tyo, 88, of DeKalb Junction, died on January 20, 2018, at her home. Calling hours will be, Thursday, January 25, 2018, 2- 4 and 7-9 PM, at the funeral home, a funeral mass will be Friday, January 26th, 10 am at St. Mary’s Church, Canton, Father Bryan Stitt officiating, burial will be June 8, 2018 at 10 am at St. Henry’s Cemetery. She is survived by her sons, Robert and his wife Bonnie Tyo of LaPlata, Maryland, Michael and his wife, Kelly Tyo of DeKalb Junction, David and his wife, Ellen Tyo of Depeyster, daughters, Lynn and her husband Doug Shoulette of Redwood, Cynthia Sperl of Trenton, Tennessee, a sister, Alice Stafford of Lafargeville, 12 grandchildren, 9 great grandchildren, several nieces and nephews. She was predeceased, by siblings, Richard Wood, and Anne Smith. Jean was born on July 25, 1930, in Lorraine, New York, the daughter of the late James and Mildred Moore Wood. She was raised by her grandmother Maude Ann Moore. She attended elementary school in Lorraine, graduated from Adams High School, and received her registered nursing degree from Mercy Hospital School of Nursing in Watertown. She married Bernard Tyo on June 5, 1954 at the St. John’s Church in Plattsburgh, New York, Father Tobin officiating, he predeceased her on May 23, 2008. Her career started at CVPH Medical Center in Plattsburgh as the night nursing supervisor, she then worked at United Helpers Moongate Nursing Home in Canton, as the night nursing supervisor from 1970 until she retired in 1992. 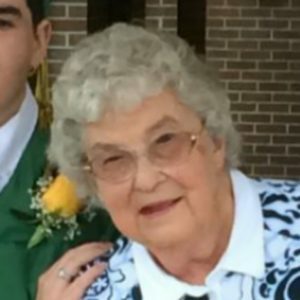 She was a parishioner of St. Henry’s Church and prior to that she was a parishioner and member of the Altar Rosary Society at St. Mary’s of Lake Church in Plattsburgh. Jean loved spending time with her family especially her grandchildren, she was the town Grandma and she enjoyed cooking. In lieu of flowers contributions can be made to American Cancer Society. Our deepest sympathies to all the family. Jean was a wonderful person and dear friend. Our prayers and thoughts are with all of you. Sharron, Joe, and Deanna and all the Gaebel Family.